Formerly a state park, Newspaper Rock is now designated a State Historical Monument, and is situated along the relatively well-traveled access road into the Needles district of Canyonlands National Park, 12 miles from US 191 and 30 miles from the park boundary. 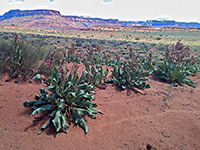 Since December 2016, this area is part of Bears Ears National Monument. 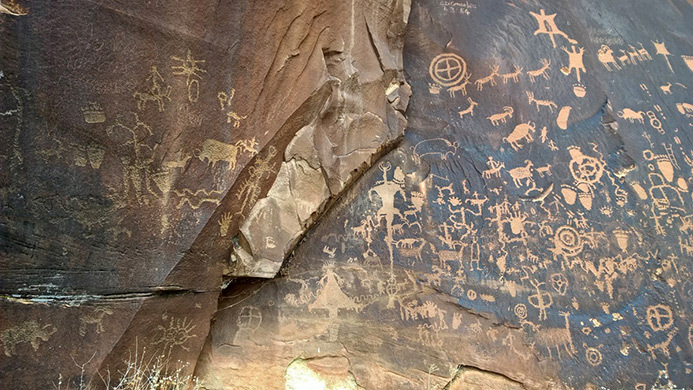 The 200 square foot rock is a part of the vertical Wingate sandstone cliffs that enclose the upper end of Indian Creek Canyon, and is covered by hundreds of ancient Indian petroglyphs (rock carvings) - one of the largest, best preserved and easily accessed groups in the Southwest. 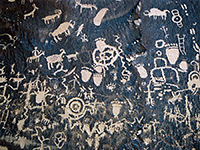 The petroglyphs have a mixture of human, animal, material and abstract forms, and to date no-one has been able to fully interpret their meaning. The monument has free entry, though no facilities apart from a carpark, sometimes with Indian jewelry sellers in attendance. The setting is peaceful and sheltered, as the canyon at this point is quite narrow, overgrown by bushes and tall cottonwood trees, with the clear waters of the creek flowing close to the road, and sheer reddish cliffs rising 250 feet above. A picnic area is located on the far side of the road, next to what was once a campsite though this was closed in late 2006 because of increased awareness of the dangers of flash floods. 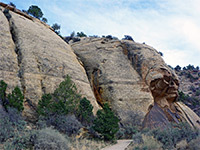 Other places on the cliffs to the south have smaller groups of petroglyphs, though the main attraction for most people along upper Indian Creek Canyon is rock climbing, since the Wingate cliffs here provide many advanced, technical routes, easily accessed from the road. 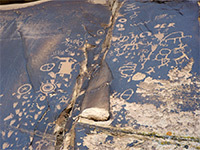 The pictures at Newspaper Rock have been inscribed into desert varnish, a blackish manganese-iron deposit that gradually forms on exposed sandstone cliff faces owing to the action of rainfall and bacteria. The older figures are themselves becoming darker in color as new varnish slowly develops. 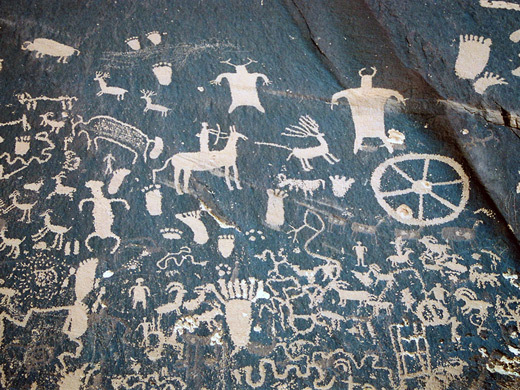 The first carvings were made around 2,000 years ago, and although a few are as recent as the early 20th century, left by the first modern day explorers of this region, the main groups have been assigned to the Anasazi (AD 1 to 1300), Fremont (AD 700 to 1300) and Navajo (AD 1500 onwards).